Seated beneath a mango tree on a bench built by my uncle is the first time I recall ever being sick to my stomach. Above me the mango tree’s large limbs branched out and extended high into the air. Many weeks before, the leaves were several shades of bright pinks with tiny blossoms. In a relatively dry season, the flowers would result in mangos so numerous that the branches would droop to the earth, heavy with fruit. If the spring and summer were particularly wet, there would be no fruit to enjoy, just a cool, shady spot to rest from the humidity of a Hawaiian summer. That summer, the first time I recall every being sick to my stomach, the mango tree was heavy with fruit. It was the summer that I turned six. The mango tree sat at the edge of one of my grandmothers many gardens. Its large trunk supported the foliage that sat atop it and shook when the trade winds blew in from off the Pacific Ocean. Surrounding the mango tree were several different types of tropical plants and flowers and different fruit trees. Red ginger marked the border on the mauka end of the garden, along with Birds of Paradise and other types of ginger. Banana trees bordered the makai end. At the opposite border, across the mango tree, were several Tahitian Gardenia bushes. Their distinct, white flowers were a stark contrast to the vibrant shades of green upon its leaves. The delicate flowers are the size of the palm of my hand and its scent is so intoxicating. In the center of the garden were more tropical flowers. The vision of plumeria trees laden with yellow and pink hues of blossoms clustered together was always a site to behold. It’s blossoming marked the beginning of summer. The fragrance, so captivating, always took my breath away. There were also rows and rows of ‘ilima plants. The ‘ilima flower is a shade of yellow-orange and is paper-thin and very delicate. At its fullest height, the shrub may reach four feet. Because it required hundreds of flowers to string together one lei, the ‘ilima lei even today, is a prized gift. Summer break was often spent at “Gramma’s” house. She lived thirty minutes from where we lived. My father would drop off my brother and I at Gramma’s, early in the morning, as he made his way to work. It was almost always dark when we arrived. We would hurry in and sleep until the suns rays gently woke us. 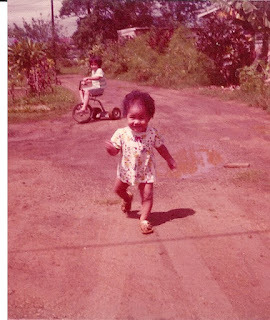 Before we could eat breakfast, my cousins that lived next door to Gramma would pick us up and we would head to the gardens on the property. 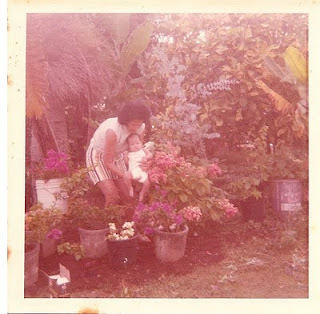 Our main chore for the day was to pick all the flowers from the trees so that Aunty Iwa , my father’s sister, could string lei’s to be sold at the local florist. The older cousins picked the delicate ‘ilima and the flowers at the tops of the plumeria tree, while I was relegated to picking the good plumeria’s that had fallen to the ground. By 7 a.m. the flowers were picked, washed, and prepared for Aunty Iwa. We’d cover her living room floor with old newspapers and separate the flowers by type and color. By 9 a.m. Aunty Iwa would have several lei’s ready for market. More cousins would show up by mid-morning. Gramma and Aunty Iwa were the babysitters for all of us. I had not known then how difficult it must have been to keep eleven of us busy and fed everyday, all throughout the summer. The typical Hawaiian summer was almost always full of blue skies, puffy white clouds, and moist, humid air. Sometimes the humidity was so heavy, so thick, that relief could only be found in the ocean. On those days, we’d walk to the beach with my Gramma leading the pack and the older cousins at the back, making sure that no one would get lost along the way. Rainy days we’d spend playing board games in the carport or playing hopscotch. We rarely ever spent any time in front of the television. There always seemed to be more important things to do like playing hide and seek in the gardens or touch football in Gramma’s large, dirt and gravel driveway. Sometimes my older girl cousins would take me to play school or bank or store. I was always stuck being the student or the customer, never the teacher, teller, or cashier. I remember once, we set up chairs to look like an airplane and we pretended we were stewardesses. 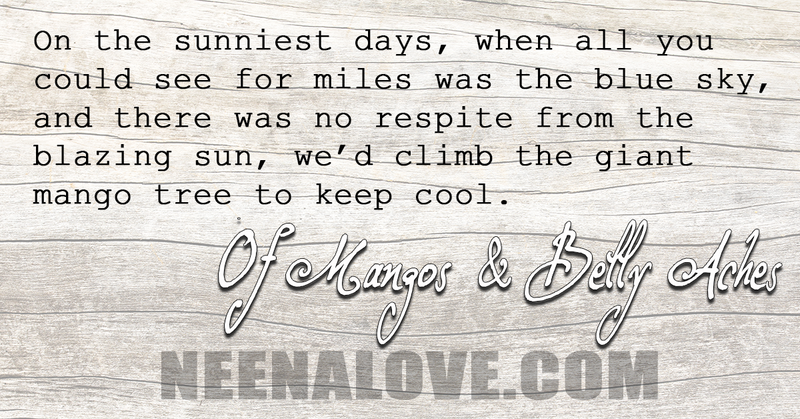 On the sunniest days, when all you could see for miles was the blue sky, and there was no respite from the blazing sun, we’d climb the giant mango tree to keep cool. The gentle breeze drowned out the sound of the mynah birds squawking. I imagine they were complaining about the humidity. On one particular day, the first time I ever felt sick to my stomach, I climbed midway up the tree. From my vantage point, I peeked into the adjacent garden and could see the large guava tree. Along the fence behind the guava tree were several passion fruit vines and along side the fence was a row of papaya trees. The mango tree was heavy with fruit that season and the limbs were beginning to bow. Certainly we didn’t want the limbs to break so it was necessary for us to relieve the tree of some of its fruit, even though they were green and unripe. I began picking the largest of the mangos and threw them to the ground. Whoever was on the ground collected the mangos and stowed them in buckets. By the end of the day, the mangos would be peeled, sliced, pickled, jarred then given away to the neighbors. There was always extra for the neighbors and any of Gramma’s visitors. That day, my cousin had brought along a glass jar full of a dark liquid. He sat on the bench beneath the tree, pulled out his pocketknife and began paring the green mango. I watched him, from where I was perched in the mango tree, open the glass jar and slice the green mango into it. My other cousins gathered around him and watched him pare and slice two more mangos. He replaced the lid and they all took turns shaking the jar. After everyone had a turn, they opened the jar and began to eat the mango. It looked so delicious and refreshing and as my cousins ate, they made these noises indicating how much they were enjoying it. I climbed down and had my first taste of shoyu-mango. The dark liquid was made of soy sauce and brown sugar. It was so scrumptious. I imagine that the combination of salt, sweet, and the tartness of the unripe mango pleased every taste bud on my tongue. Also, the obvious delight on everyone’s face added to my enjoyment. When the mango in the jar had run out, my cousin pared and sliced more as we ate and repeated the process until not a drop of sauce was left in the jar. As soon as the sauce was gone, the excitement of the new experience wore off, and my six-year old belly was left with the biggest ache I had ever known. I don’t remember how long it ached but I do remember that wonderful taste. If there had been more sauce, I’d have drank it up like a tall, glass of water. My brother and my cousins continued with the chores associated with pickling the mangos and I was left, seated on a bench built by my uncle, under a mango tree having the time of my life.